Nothing says summer like a tall glass of sweet and tart lemonade! So when I saw these personalized lemonade packets I just had to share them! How fun would it be to have baskets of these lemonade packets at your reception for guests to take with them? It would be super FUN! And really, everyone loves lemonade. You could even have a “lemonade bar” at the reception where guests could enjoy the perfect summer beverage – and even add something extra to their glass. (It IS a bar, after all). Oh, I think I’m on to something! 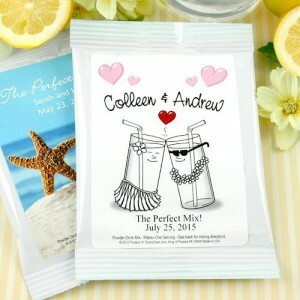 You can choose from a variety of personalized packets for this wedding favor. You’ll find these lemonade packets here.